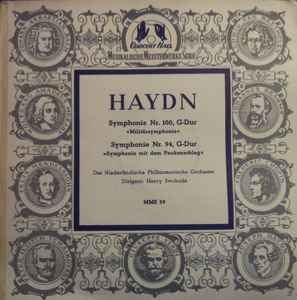 Haydn* - Das Niederländische Philharmonische Orchester*, Henry Swoboda ‎– Symphonie Nr. 100, G-Dur "Militärsymphonie" / Symphonie Nr. 94, G-Dur "Symphonie Mit Dem Paukenschlag"
Symphony No. 100 G Major "Military"
Symphony No. 94 G Major "Surprise"
The title is printed in German on the front cover, the center labels are in English.